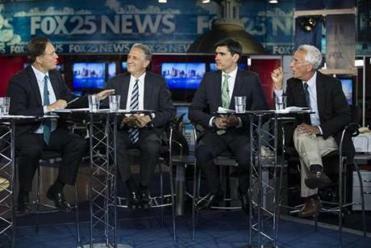 And now Steve Pagliuca and Daniel Doctoroff vs. Chris Dempsey and Andrew Zimbalist in the Boston 2024 Olympic debate, which aired Thursday night on Fox 25. The hour-long debate over Boston’s bid, sponsored by the Globe and Fox 25, drilled deeply into the minutiae of Olympic finances. This was a debate dominated by skull-imploding talk about the all-important financial issues. Both sides bombarded us with numbers. It was like trying to make sense of the “science” of Deflategate. You’d need a Ken Burns 10-part series to shed light on all the flaws in the Boston 2024 blueprint, but we had to settle for one hour. Thursday’s showdown unfolded in a TV studio with no public audience. That’s the way the Boston 2024 likes it. It would not have been good for the pro-Olympic folks to hear Hub hostility aimed at Messrs. Pagliuca and Doctoroff. The debate was moderated by Fox 25’s Maria Stephanos and the Globe’s Sacha Pfeiffer. Most of you know Steve Pagliuca. Nice guy. Co-owner of the Celtics. Ran unsuccessfully for the US Senate. He comes across as smart, a tad boring, but sincere. The same cannot be said of USOC board member Daniel Doctoroff. Doctoroff is the guy who tried to get the bid for New York. He is a New Yorker. He spent most of Thursday’s debate telling us what’s good for us. Dempsey is co-chair of No Boston Olympics. He has amazing teeth and did a pretty good job for the contrarian side. He was joined by Zimbalist, a noted blowhard, author, and Smith professor of economics who hates the idea of the Olympics coming to Boston. I’m with the NIMBY crowd on this one. I think bringing the Olympics to Boston is the worst idea since the Red Sox decided to put Hanley Ramirez in left and give Rick Porcello an $82.5 million contract extension. Pags got things started by denying that the new transparency of Boston 2024 was motivated by the urgency of Thursday’s debate. “We want to put things out that are right, not just quick,’’ said Pagliuca. Well-meaning Pags quickly segued into his senatorial speech pattern (the time-share pitch) that makes folks glaze over. Stephanos and Pfeiffer tried to reign him in, bit it’s not easy once Pags gets going. When Pfeiffer asked Dempsey why NBO would not release names of all who contributed to his group, he said, “It’s important to protect the little guy,’’ citing potential retribution, presumably from the big shots pushing Boston 2024. Speaking for the USOC, Doctoroff denied Boston might lose the bid to Los Angeles: “Rumors are rumors. They were never true. We were not looking at LA. Boston is our city.’’ This will be a handy quote to resurrect if the USOC pulls the bid from Boston in September. When Dempsey asked, “If they are so confident with their budget projections, why are they asking for a taxpayer guarantee?’’ Pagliuca claimed the No Boston folks were engaging in hyperbole. “What about the seven years leading up when all the construction happens?’’ asked Zimbalist. Bingo. Big point for No Boston Olympics. It got worse for Pags and the Doc in the closing minutes. Every time the No Boston guys raised legitimate points, the Boston 2024 guys would charge hyperbole. It was “a robust discussion, for sure,’’ Pagliuca said in his closing statement. In my view, there are only two groups of folks who favor bringing the Olympics to Boston: 1. People who stand to profit; 2. Hopelessly naive people. I’m putting Pags into category No. 2. He doesn’t need this. He’s doing it because he believes in it. Here’s hoping the USOC pulls the plug on the Boston bid. I don’t believe Doctoroff when he says those rumors were never true.